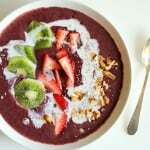 Kiwi Strawberry Açaí Bowls are a nutritious and delicious vegetarian breakfast. I’ve been going through a sizeable bout of FOMO (fear of missing out) these last few weeks. As in, I want to do, be, see, say, cook, experience, feel, learn, know allthethings. It feels like there’s just not enough time in the day nor funds in the world to be this epically perfect person carrying around all the epic stories to share with all the people in every nook and cranny of the world. You know how this FOMO thing works…your friend buys a house (or a second house), gets the cutest dog that you just want to squish against your face, quits his/her job and books flights across the world for a year-long travel extravaganza, or gets a stellar promotion with stock options, royalties, and dividends and is jettisoned face-first into responsibilityhood. And you just feel like you’re being left in the dust. With Val Kilmer in Tombstone. 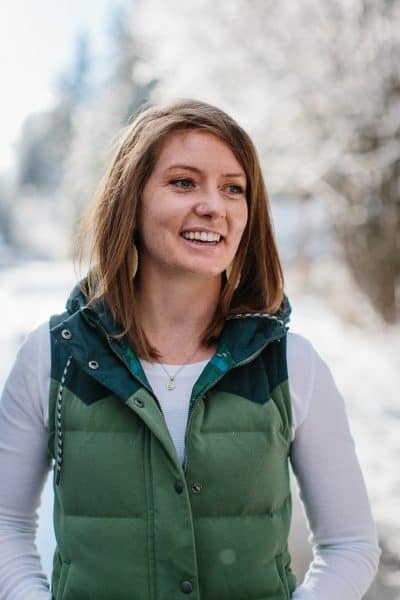 …and then yank yourself out of the FOMO hole by reminding yourself of all the things that are going right, as opposed to focusing on what you’re missing. Like having amazing friends and family, enjoying a simple life, having your health, and being on the path you’ve chosen, no matter how far down that path you’ve gotten thus far. Last week, my FOMO came to a head and I had to take a step back and go “WHOA. The expectations I’ve been body slamming upon myself had been slow cooking inside me and were just about to boil over when all of a sudden, I snapped out of my tunnel vision and put myself on timeout. And you know what I did? I made this açaí bowl. It sounds lame, but smoothies, smoothie bowls, and açaí bowls have this incredible calming power over me. Show me a pissed off person who is drinking a smoothie. Said person does not exist. You just can’t be angry while nourishing your body with exactly what it needs. From a scientific standpoint, that “healing power of smoothies” thing is probably just the result of raising my too-low blood sugar. But from a metaphysical standpoint, I like to believe there’s more to it than that. The simple act of getting a great deal of nutrients efficiently through a vibrant açaí bowl gives you an appreciation for the manner in which you take care of yourself. And you guys, they’re so freaking good! 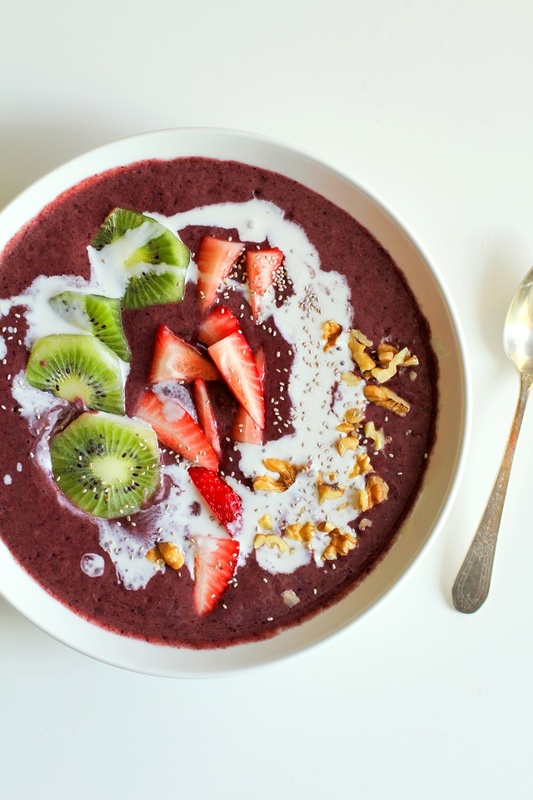 If you weren’t present for the Fruit & Nut Açaí Bowls I posted a few months back, I’ll give you a quick recap: açaí berries are nutrient-packed superfruit full of antioxidants, omega fatty acids, B vitamins, vitamin K, and fiber. You can pick up packages of frozen açaí berries from your local natural food store, or do as I do and use açaí powder. Simply blend up the ingredients like a smoothie and serve that sucker up with your choice of fresh fruit, nuts, chia seeds, and a drizzle of full-fat coconut milk. Because we’re nearing the end of kiwi season, and strawberries have been so sweet and juicy, I chopped up the two for enjoying atop my smoothie bowl. Did you know kiwifruit are alkaline? This is especially good news for someone like me who eats almost nothing but acidic food (errr…cough cough pots of coffee cough choke ahem) They are also full of Vitamin C, Vitamin E, fiber, and antioxidants (more about the health benefits of kiwi here). And strawberries? We don’t think of them as an astoundingly great-for-you fruit since they taste so dang good, but you guys, they’re grrrrreat for you! Also chock full of Vitamin C, antioxidants, and a natural inflammation reducer, strawberries are known for fighting cancer, promoting healthy skin, and regulating blood pressure. Don’t get me started on walnuts. Okay, do. Protein, omegas, antioxidants, done! Shoo! In essence, you’re looking at a de-stresser, de-bloater in a bowl, and a tang scrumptious meal. They may not dissolve all of your FOMO, but they’ll be there for you when you need to take a deep breath, exhale, dance it out to Ellie Goulding and Calvin Harris, and take a chill pill. Add the banana, coconut milk, blueberries, and açaí powder to a high-powered blender. Blend until smooth. Pour into a bowl and serve with chopped strawberries, kiwi, walnuts, and a drizzle of full-fat coconut milk and chia seeds. *You can replace the acai powder and blueberries with 1 3.5-ounce packet Sambazon pure acai berries, thawed slightly. So, is there an opposite to being jealous that someone bought a house? FOBR — fear of being responsible? Or is that really just called “I’m too lazy to mow my lawn”? Apparently I’m also too lazy to use the frozen acai packets in my freezer because weeee I just realized I bought a bag of them at an outrageous price and have literally never touched them. Acai bowls in my future, please! ‘Show me a pissed off person drinking a smoothie'<– hahaha, I love this! I have this too, alll the time. I feel like at this stage in our lives it's so easy to see everyone else doing all these crazy/awesome things and I'm over here all blahh I'm in my yoga pants and eating chips for dinner. Whew. Ok I am so not FOMOing on this bowl situation! Yoga pants + chips for din din sounds like a marvelous evening. Let’s drink all the smoothies and eat all the acai bowls togethaaaaaah! Acai!! It’s been such a long time since I’ve had acai ANYTHING. The FOMO struggle is real. I’ve seen so many of my friends buy houses or go on my dream vacations lately that I just want to say, GAH. When do I get a piece of the fun? I’m so ready to dig into this bowl and forget about everything else. Show me a pissed off person who is drinking a smoothie. < I'm dying. I think my FOMO increased a bajillion times as soon as I started reading blogs. It's so easy to compare ourselves to everybody else but the truth is, most of them are writing about or taking pictures of the bad stuff. I'm sure there are a few skeletons hiding in the closet in even the most seemingly perfect person's house. But I'm glad you came to your senses, realized how awesome you are, and made yourself a smoothie. I'm confident this GOGREOUS acai bowl could brighten even the darkest of days!! Ugh…of course the one word I misspell is in all caps, lol. I wouldn’t have noticed unless you pointed it out, haha! I’m the WOSRT (<- get it? buh-dum-ching) speller in all the universe. Thank God for spell check. Thank you for validating my FOMO feelings. Reading other blogs can be cause for serious envy, and I do have to remind myself that nothing is perfect behind closed doors for anyone. Love you, m'dear! I LOVE açai bowls. 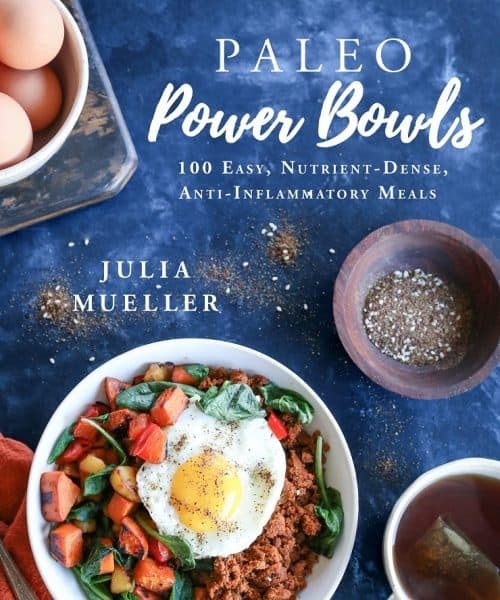 I’ve been doing mine with frozen papaya, frozen mango, frozen strawberry, frozen açai and protein powder (with some liquid whey to make it work) – served with homemade granola on top, it’s wonderful. I will be trying yours, too, using frozen açai. That’s one of our favorite breakfasts. Wahoo!! I’d like to be invited to one of your acai bowl breakfasts, please! 😉 Papaya and mango sound absolutely amazing and granola on top?! Ugh, perfection!! HELLO BEAUTIFUL BOWL OF BREAKFAST YUMS. I need this in my face. Maybe for dinner, because I CAN. And FOMO. I Know it well. Clearly the only logical thing to do was make an acai bowl. You done good. Pinned! I cannot begin to tell you how addicted I am to acai bowls. I CANNOT WAIT to make this and am definitely going to go check out your other acai bowl I missed. If it wasn’t 9pm, I’d be running my VitaMix right now, but waking up my kids is probably not a good idea, huh? 🙂 Seriously, this is on my must-make list! Thank you for sharing! Time out corners from FOMO stress should always involve these acai bowls. I feel calmer about ALL THE THINGS just looking at all this color and nutrition in one place! Imagine how I’d feel while eating it. I adore this bowl. Of course with kiwi strawberry acai in it. I was surprise by the fact that it only took 10 minutes to finish this. Wow, very impressive. Absolutely going to do this. Thanks for sharing this lovely recipe my dear.